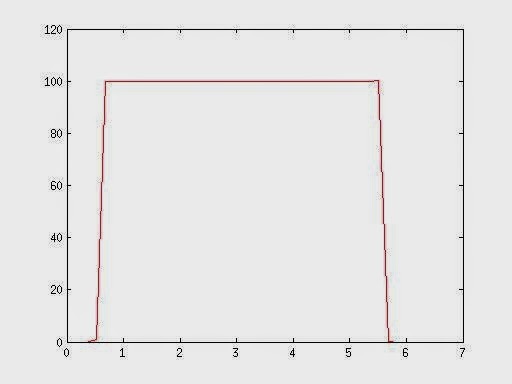 The total displacement measured by the robot was exactly 500 mm and after the acceleration phase the velocity is constant at 100 mm/s. Next, the results for the measurements with the camera will be shown, the results are for distances of 200, 300 and 400 mm. At a frequency of 1250 Hz the results are very oscillatory, this is due to the slow movement and high sampling rate causing the consecutive frames to be very similar, causing problems on the correlation. At 500 Hz the result is the most similar to the ground truth, having a phase of constant velocity. At 250 Hz the correlation also showed some problems. 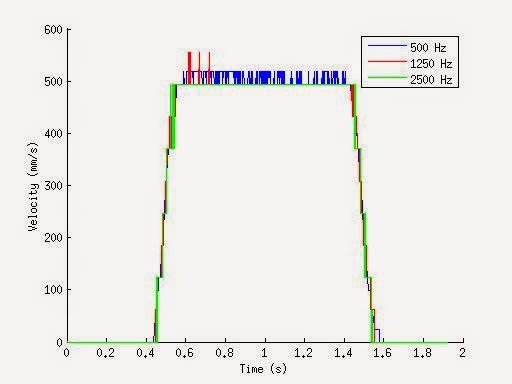 The best results were at 500 Hz, next will be shown the plot of this camera measurement vs the robot. 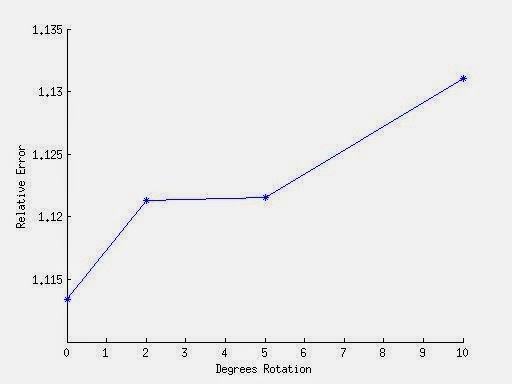 As we can see, there is an error measuring the velocity, in the phase of constant velocity the error was 1,26%. The total displacement calculated by the camera was 493,4959 mm, giving an error of 1,3%. Next are shown the results for the tests with oblique movement, in this case the error evolution is shown. 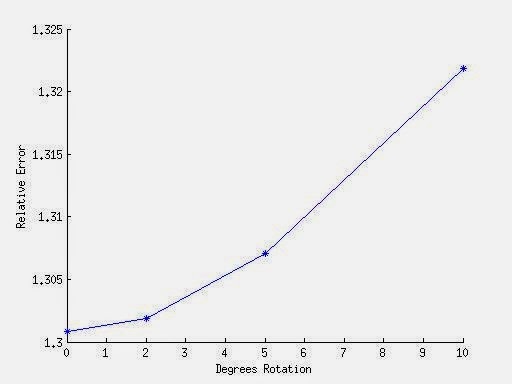 There is a clear increase of the error with the increase of inclination in the movement, although this growth is small and the correlation works good. At a frequency of 2500 Hz the result is the most similar to the ground truth, having a phase of constant velocity. At 1250 Hz the correlation also some problems having some reads with a higher value than the ground truth. At 500 Hz the results are very oscillatory, here the correlation method failed at some points due to the less overlap between frames. 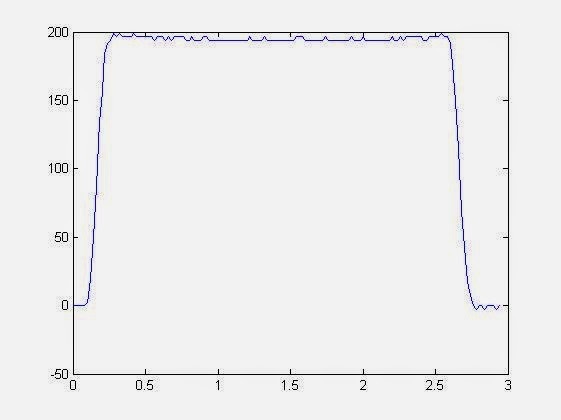 The best results were at 2500 Hz, next will be shown the plot of this camera measurement vs the robot. 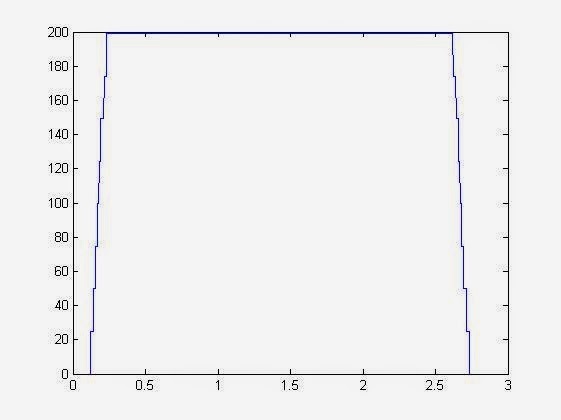 As we can see, there is an error measuring the velocity, in the phase of constant velocity the error was 1,26%, the same as at 100 mm/s. The total displacement calculated by the camera was 494,4329 mm, giving an error of 1,113%. 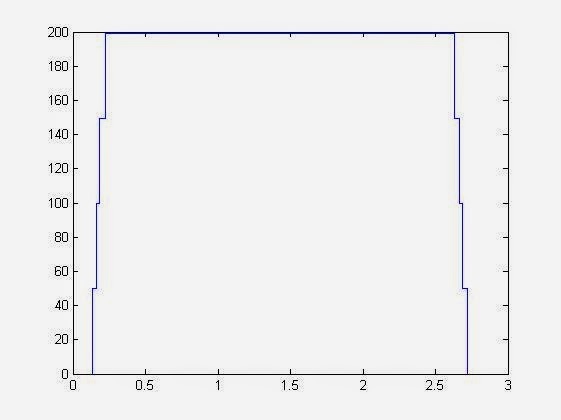 As seen at 100 mm/s, there is a clear increase of the error with the increase of inclination in the movement, although this growth is small and the correlation works good. At the distance of 300 mm the field of view was 80.27 mm. With the horizontal (0º) movement at 100 mm/s are shown the velocity plots were very similar to the ones taken at 200 mm, although at 300 mm the best results was at 100 Hz. In the phase of constant velocity the error was 1,9%. The total displacement calculated by the camera was 509.0561 mm, giving an error of 1,811%. At 500 mm/s the velocity plots were also very similar to the ones taken at 200 mm, the best results were at 500 Hz. In the phase of constant velocity the error was 1,9%, the same as before. The total displacement calculated by the camera was 508.2722 mm, giving an error of 1,6544%. The error growth was also similar in both velocities. To prove that measuring velocity of a vehicle with a linear camera is possible, it is necessary to do measurements of movements and compare it with the ground truth. A industrial robot will be used for this purpose. The robot is well calibrated and has a very accurate positioning system, thus its movement is taken as ground truth. The robot gives its position data through a TCP/IP connection to a C++ client application. This application also calculates the time-stamps, later the velocity is calculated with this information. 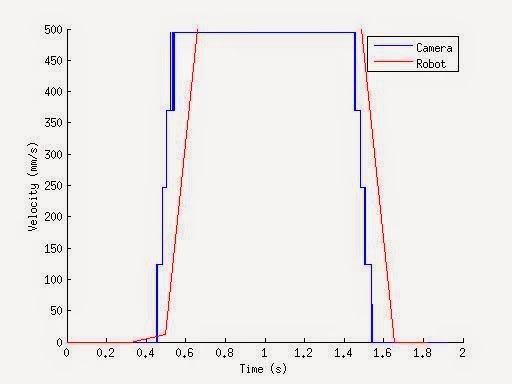 The acquisition rate is limited to 5 Hz due to the communication settings in the robot server. In the first phase the movements will be simple linear movements and with constant velocity. Measurements will be done with the camera sensor horizontal to the movement and next measurements with the sensor oblique to the movement. Oblique movements can happen in the real world when the vehicle has perpendicular component on its movement, also it can happen when the camera isn't well installed. 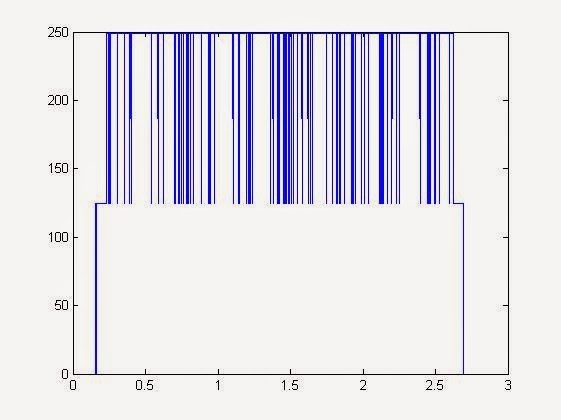 When the sensor has an angle with the direction of movement the frames will be captured as shown in the figure 1, the consecutive frames will have less similarity and is the correlation expected to be weaker, this will be one of the sources of error. There will be made experiments at 100 mm/s and 500 mm/s, each of which will have measurements with the sensor at 0 degrees (horizontal), 2, 5 and 10 degrees of rotation to induce the oblique movement. The materials that will be used as ground will be cork, concrete, stone simulating pavement and cloth. With this material is possible to simulate a broad kind of textures. Fine grain textures with the concrete, gross grain textures with the stone simulating pavement, textures with high variation with the cork and regular repetitive textures with the cloth. In the first tests was discovered that the light from the sun has a high influence on the image brightness and with this influence the captured image had a big brightness fluctuation throughout the day. To solve this problem and to have constant condition throughout the day the sun light was blocked in the lab. Instead artificial light will be used, the lighting will be done with two 500 W spotlights to provide enough brightness on the scene. Due to safety issues the robot will be used at a maximum of 500 mm/s. The robot base is not fixed on the ground and high velocities should be avoided. The maximum frame rate to be used in the experiments will be 2500 Hz. With this camera it cant be higher than that or the image will have lack of brightness due to low exposure times. For higher frame rates another camera should be considered. This first test was made to assure that all the procedures are getting rightly done. This test was made with linear movement with total of 500 mm, horizontal to the camera sensor. The distance from the tip of optics to the "ground" was 200 mm and the velocity of the movement was 200 mm/s with a phase of acceleration at the beginning and deceleration at the end. The positions of the manipulator and the instants are registered through a Ethernet connection and simultaneously another computer does the frame's acquisition. The acquisition was set at 5000 Hz line rate. 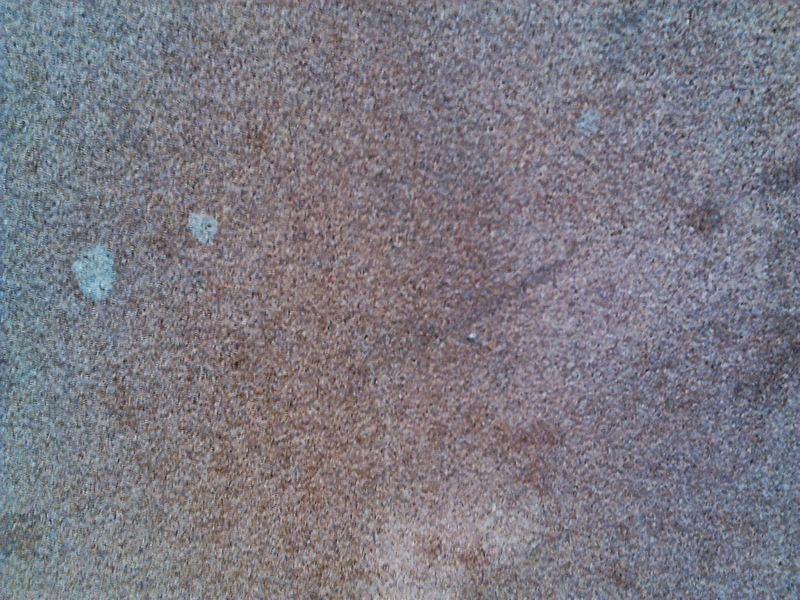 The texture used as "ground" was a piece of cork, as shown on figure 1, this texture is composed mostly of fine grain and should, in theory, represent a hard texture to find matches. Figure 1 - Texture used as ground. 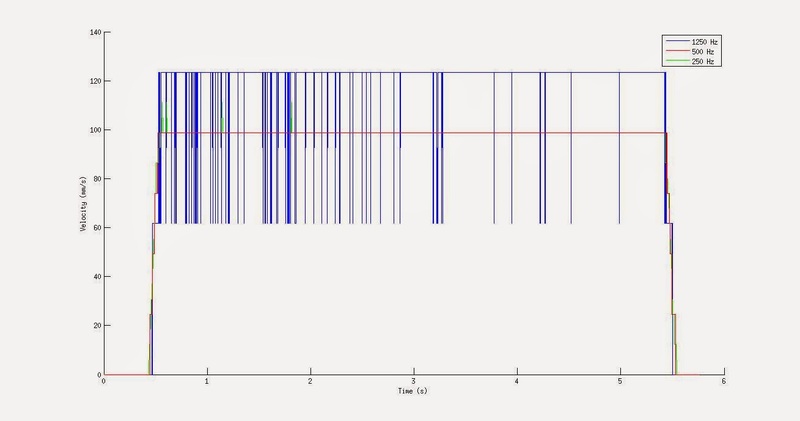 The calibration was done using the pattern described in the previous post. 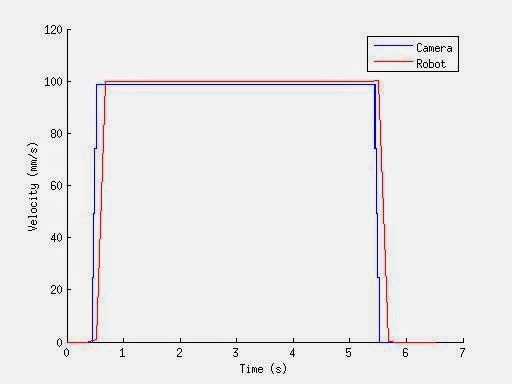 In the figure 2 there is presented one of the trials of the calibration process, the camera was adjusted until the spaces between the pairs of lines were all equal to assure that the sensor is truly horizontal to the movement of the robot. The field of view in this experiment was 51 mm. Two methods of correlation between consecutive frames were implemented. The Pearson product-moment correlation coefficient, used by  and the cross-correlation method using Fast Fourier transform, highly used in signal processing. Both the methods showed good results, although Pearson's correlation method has a high computational cost, so the cross-correlation method is the most suitable to process high quantity samples. With the sample of 5000 Hz were made various tests, one using the full sample at 5000 Hz, one at 2500 Hz, 1000 Hz, 500 Hz and 100 Hz. At 5000 Hz the velocity calculated at all instants was zero, this is due to the very high sampling rate which caused the consecutive line to be very similar to the previous one and thus the pixel displacement to be zero. And the total displacement calculated is listed in the following table, the real displacement measured by the robotic manipulator was 500 mm. Camera calibration is a very important step, it is necessary to get the relationship between the object coordinates and the image coordinates. With known parameters of the camera model, including internal parameters and external parameters it is possible to determine this transformation. Calibration is used to determine this parameters. Camera matrix is one of the important internal parameters and position and orientation of the sensor to the world coordinate system are some of the important external parameters. In order to calculate the ground displacement from displacement between frames is necessary to know the relationship between the image size and the field of view size. Knowing this relation it is possible to calculate the real ground displacement at a given distance from the ground. The field of view is obviously dependent of the distance of the camera to the ground and for a better result it is essential to know this distance. Therefore in a real implementation a method of estimating this distance should be available. In this work the test will be carried out with the help of a industrial robotic manipulator and his position will be used as ground-truth. With this configuration it is easy to see that when the camera is completely horizontal the spaces between the pairs of lines will have an equal distance, and when the camera is oblique this spaces will have a tendency to increase or decrease depending on the orientation of the sensor. In the figure 2 is possible to see a image of the process of calibration, the image shown here is the representation of 480 repeated lines since the camera has not moved. The camera is adjusted until all the distances between the pairs of lines are equal. Once that is accomplished, the camera sensor is horizontal to the pattern and therefore horizontal to the movement. Figure 2 - Image taken during the process of calibration. The specifications of the camera are shown in the table 1. The output format is Camera Link, this imposes us some limitations, the acquisition will have to be on Windows workspace due to the lack of drivers. We only have access to the software provided by Teledyne DALSA and so we will have to capture the frames and posterior computational processing. The camera has a very high speed and is highly configurable, it has the ability to work from 350 Hz to 36000 Hz and with a resolution from 128 to 4096 pixels. The literature suggests visual odometry as a better odometry system in terms of precision and error accumulation. Navid Nourani-Vatani et al ,  obtained good results using a common webcam at 20 fps and a image resolution of 640 x 480 pixels, they used template matching with a searching area of 320 x 320 pixels (figure 1). The acquisition speed was set to 20 fps due to the high processing time, 42 ms/frame, this is a clear limitation. Also due to the low frame rate, the velocity of the vehicle was limited to 1.5 m/s, which is very low. Nevertheless this method showed better results than common wheel's odometry. The velocity allowed by the measuring unit is are mostly influenced by the sampling rate and the size of the image. If the velocity is higher than the limit, there will be no overlap of the frames and there will be no similarity between the consequent images, this will cause the impossibility of the estimation of velocity. So for car-like velocities it is necessary a very high sampling rate camera, this brings difficulties as the computational power needs to be considerable. Viktor Kálmán  used line scan cameras to achieve high velocities and resolution, using less computational resources than a common matrix camera. The sensor used was capable of measuring movements of vehicles up to the range of 100m/s with high accuracy. Visual odometry has clear advantages over the common wheel's odometry. It is possible to measure velocity independent of the variations in tire pressure, tire diameter, uneven terrain and tire slip. It is possible to obtain a compact and easy to install module. However there are several drawbacks, the lighting is an important factor and it isn't always possible to control, also the sensors are high price and sophisticated. There are three kinds of odometry solutions to solve this problem, common odometry with wheel's sensors, visual odometry and inertial sensors, has said previously. Visual odometry and inertial sensors have great advantages mostly because this sensors are small, compact and can be mounted in a non-invasive way. But this sensors have too much downsides, visual odometry lacks the necessary resolution for high velocity, the robustness to be used in every type of road floor and every luminosity conditions. Inertial sensors also fail by the lack of resolution and accuracy and also by the high cost. As one of the most important goals is to obtain high accuracy this two systems have to be disregarded. 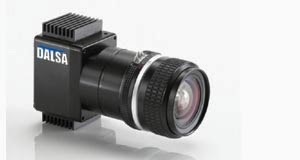 The optical solution, like the ones provided by Kistler , is a great solution to measure the velocity, is easy to setup, non invasive and compact. However, there is still the need of an additional device to monitor the steering angle which is a very important information. The solution to be focused in this project will be a odometry system with wheel's sensors, this is the best solution because the accuracy can be easily increased with higher quality sensors than the existing ones and the cost can still be low. The main downside is the complexity of the apparatus that need to be developed to support the sensors with a non invasive and easy setup. For wheel velocity sensors there are two main options, the optical sensors and the inductive sensors. In the optical sensors group there are the incremental optical encoders and absolute optical encoders. All of the above are based in pulse counting in which its frequency indicates the velocity of the vehicle, except the resolvers which are inductive analog sensors. The line of light passes throgh the coded pattern of the rotot and that corresponds to a unique code that specifies the absolute angular position. There are several ways and combinations to solve this problem, after some research and thinking, the next topics are the chosen solutions to be discussed. The two two-phase windings generate a sine and a cosine wave. With this information it is possible to calculate the angular displacement of the shaft. with this configuration it is possible to calculate the velocity and orientation with the difference in velocity on the two wheels. This is a simple configuration, with low setup complexity and low cost. Although we can calculate the vehicle orientation angle, this system doesn't provide the front wheel orientation which is a very important information. This solution implies the existence of some device on the inside of the vehicle cabin, it is very hard to install a device on the steering wheel without it being a obstacle to the driver. This is a practical solution because with one single device we can monitor all the wanted magnitudes, this makes it a good solution in terms of compactness and easy to setup. The major downside is the complexity of the apparatus needed to support the sensors to keep with all the front wheel degrees of freedom. With this configuration we can monitor both wheel's velocity and steering angle. There is the downside of the need of two separate devices, one for the front and one for the rear wheel. However this is a low complexity system to produce and setup. This is a blog to report the activities and developments of my Master's Thesis, in Mechanical Engineering, on the theme "Removable Odometry Unit for Vehicles with Ackerman Steering". This work is being developed at Aveiro University.